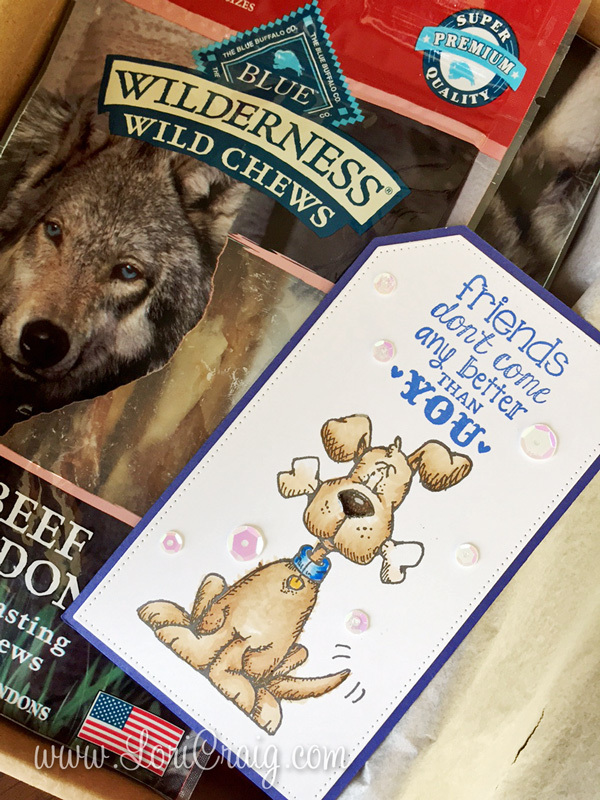 Coloring four-legged fur-babies with Copic Marker today and sending a thank you card to my sweet neighbors who watch my dog like a hawk when I run errands or am out of town! This is Mr. Walker. He is 10 years old. 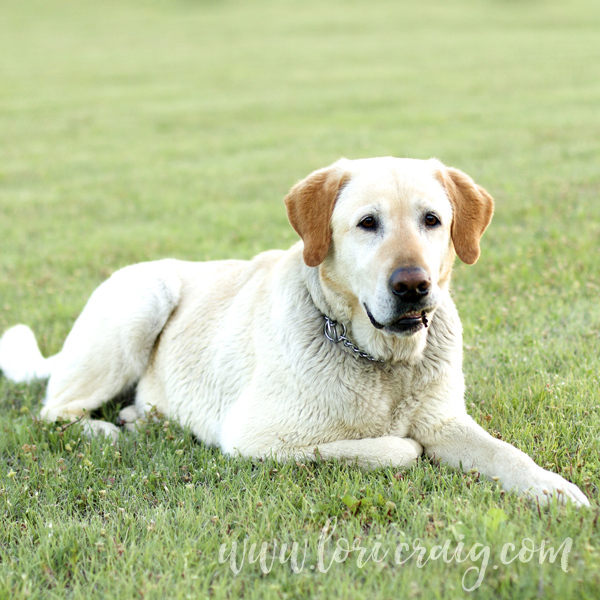 He loves to romp in the tall grass, hunt ducks and retrieve his plastic throw dummy. He also likes it when you rub under his chin or right between his huge floppy ears. This stamped image from Whipper Snapper was one of the very first stamps that I ever colored with Copic Marker years ago (you can see that card here), and while many stamps are re-gifted or thrifted over time around here, this one so sweet for lab lovers like us that I’ve never been able to purge it from my collection. 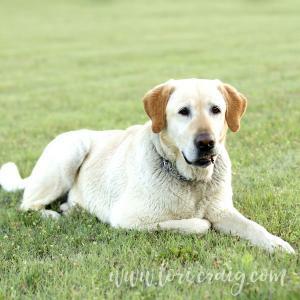 The stamped is called Harry the Dog, but it looks like he is retired. Coloring our pets can be a challenge, but it’s easier with the Coloring Cats and Dogs with Copic – written by Marianne Walker. The book is great for beginner or intermediate artist who want to improve their Copic techniques. It will teach you how to smoothly color, blend, add texture, and create fur in a variety of lengths. To color Walker on this card, I was able to use a recommended blending trio right from the book – E50 for the base and shading with E42, YR21 and YR23. Tip: The Copic Coloring Number system with a graduation of saturation (gray) and value (light and dark) doesn’t apply number-by-number in the earthtone markers. You may find yourself using colors from a wider series of numbers – don’t let that alarm or worry you. Here, I used the E50 for a creamy undertone and E42 for light shading, then brought in more of Walker’s golden/red coloring with YR21 and YR23 sparingly. The Coloring Cats and Dogs with Copic Marker book is a nice resource with a great variety of popular pet breeds represented with step out photos and suggested color combinations. 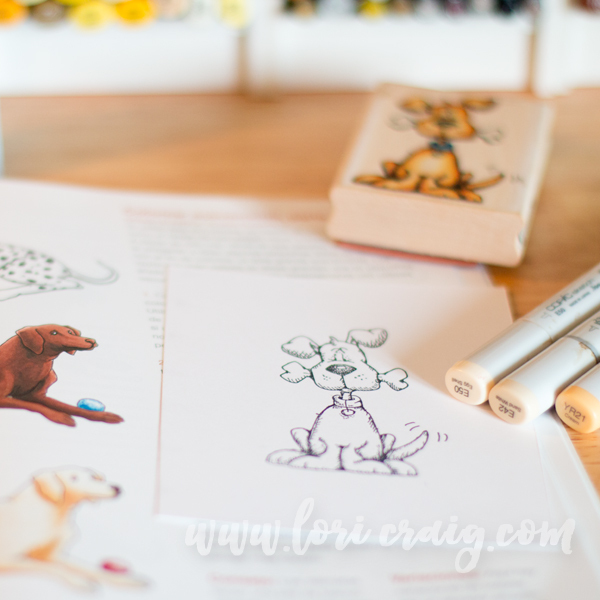 There are also line art pages that you can practice coloring step-by-step with the book. Speaking of Walker, he needs brunch, so I better run! I’ll be back tomorrow with something fun! I have some sweet little puppy friends, Roger and Tessa, who graciously share their mom with me whenever I visit Southern California. So, I wanted to send them a little thank you for their recent hospitality! My husband’s company manufacturers these all USA, high quality pet treats, and I thought they’d enjoy them about as much as I love spending time with Jami! 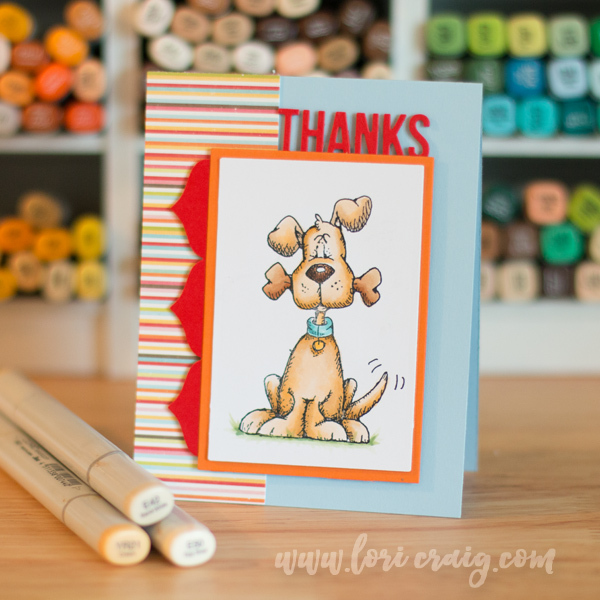 Dog stamp is from Whippersnapper Designs – colored with Copic. Different fur blending styles are something we cover in our Clothing and Accessories class. 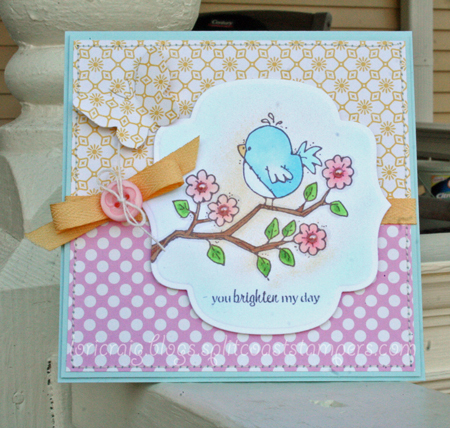 The sentiment is from Taylored Expressions’ Big Bold Valentine – which I use year around! Have a great Tuesday! Arf! Arf! I love Conway Tweetie from Whipper Snapper. (I loved the real Conway, too!) Isn’t he just the cutest? He arrived in my mailbox on Saturday afternoon, and I immediately put him into rotation of the ‘new and needs ink‘ rubber pile. He’s colored with Copics and highlighted with YR31 and BG000 from the airbrush. I matched up some October Afternoon paper from the Ducks in a Row collection. Die-cut butterfly gives Conway something to look at without detracting from the overall focal point. The weekend was heavenly around here. On Saturday, I only left the house to go thru the drive-thru at the bank. I watched 3 Hallmark Christmas movies with my daughters – all three made me cry. I made 5 cards. 5 cards! I don’t remember the last time that happened. 🙂 Last night was our annual church Thanksgiving Dinner. Fabulous! Cardstock: Ducks in a Row – October Afternoon, Choice White – Taylored Expressions, Soft Sky – Stampin’ Up! Weekend Sketch Challenge #95. You can get Beate’s Sketch here. I was in the mood for some solid images and some colored ink pads last night. I do miss straight on stamping every now and again. 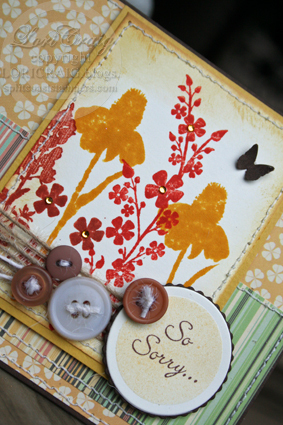 I paired Wildflower Silhouettes by SweetMissDaisy with CosmoCricket’s Earth Love papers. Oddly, I was hesitant with all the layers in the sketch, but happy with how this came together. I hope the other sketch girls had fun with it. I can’t wait to see what they’ve got. Check them out: Beate, Cambria, Charmaine, Jenn, Laurie, MaryJo (posting later) and sweet Sharon. When I’m tired but can’t sleep, I don’t count sheep. I stamp. This was cranked out at 2 a.m. last night just for fun. So, now I’m going to type a quick blog post and take a nap then start the Mom Taxi and the dinnertime hoopla. The WhipperSnapper images were colored with Copic Markers below. I’m sure you’ve seen and read about the new extra light Copic colors that became available last week. 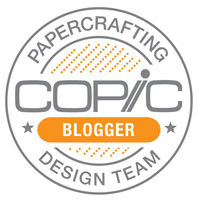 (You can find them in stock and on sale at eclectic Paperie.) 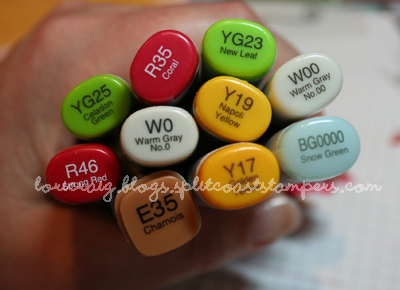 These are great for shading and blending. I used the BG0000 for the sky background, and my personal favorite the Warm Gray 00 for shading. So hard to photograph, but these extra light hues let your colored projects shine and highlight on their own. The shading and shadowing should be really subtle and soft. It should should not scream, “SHADED! SHADOWED!”. You’ll get that with these new extra light colors. One quick note: if you frequent my blog, you know that the 9th of the month is usually when I post my Divine Design challenge for the month. I wanted to let you know that I’ll be posting next week on the 16th, along with Angel, Nancy and Jami. Thanks for stopping by. It’s time to mash potatoes. It’s the last day of school around here…early, I know! But, we only get a 2 day spring break, and it seems we’re always out very early compared to my friends’ kids. This was the one photo that turned out halfway decent from my oldest daughter’s teacher gift. I totally stole this idea from Beverly Rousch, stamper extraordinaire. 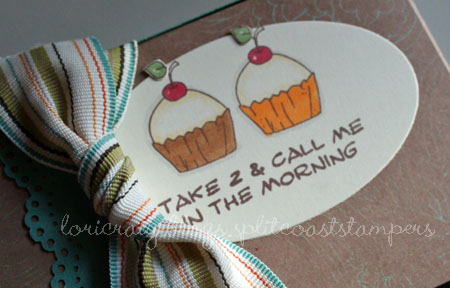 I thought it was an adorable play on words with the What’s Cookin‘ set from Whipper Snapper Designs. It was perfect for our little truffle boxes. Of course, I had to explain the sentiment to my 8 year old who wondered why her teacher would need to take 2 aspirin. Let’s see 24 eight year olds? Is 2 aspirin enough? 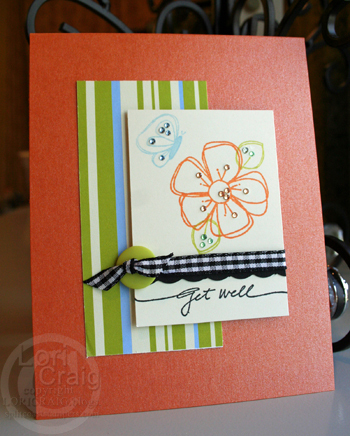 Used up some scraps from that piece of cute Jillabean Soup paper that Alli sent me to use yesterday. 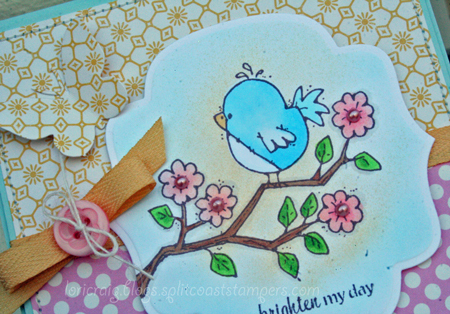 I stamped images from Simply Bloom, set from Whipper Snapper Designs, illustrated by Anna Wight. The images are stamped with Memento Dew Drops and accented with Tiny Twinkles from Taylored Expressions. 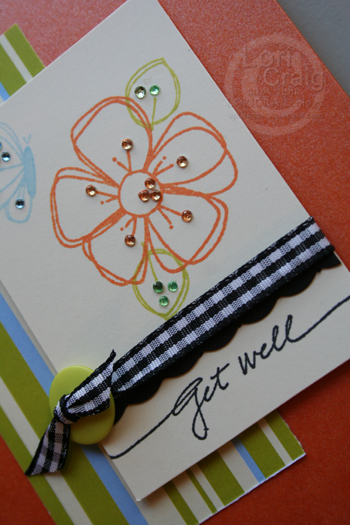 The card base is StarDream Metallics – Flame (orange). 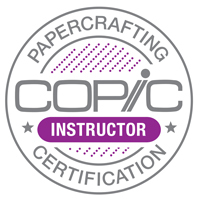 I get mine at CutCardstock. Told you it was a quickie. 🙂 Thanks for stopping by. I’ll see you tomorrow. 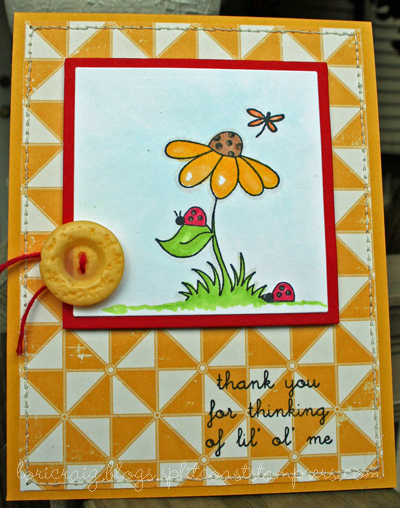 Just for Marianne, I’m sharing a quickie today that I created with the set, Little Critters, illustrated by Anna for Whipper Snapper Designs. I colored my little elephant with a custom shaded Copic marker. I used a combo of BG000 and Copic Blender solution to create my custom color. I love those low numbered blue/greens, and adding blender solution lets you get varying shades of your favorites. You can check out Marianne’s excellent tutorial today. I have done this to create several of these ‘custom color’ markers that I use frequently My other favorite color combo is YR31 and Copic Blender solution. (That one’s a trick I learned from Debbie O). Patterned paper is from the Girl Friday line – Cosmo Cricket. 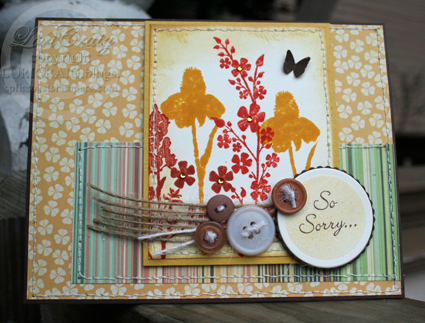 Finished card is 4×4 square. 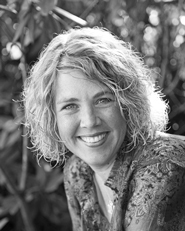 I’m celebrating another great Anna Wight release at Whipper Snapper today. Isn’t this fun? The sweet chicken and her bowl are from a set called Chicken’s in the Kitchen, and the sentiment is from a set called What’s Cooking – both being released today. All images colored with Copics. The main image panel and the paper pieced apron decorative papers are from a 4×4 pack of Jenni Bowlin papers. Love them on the small scale. Chocolate frosting was added with Chocolate Dimensional Pearls from Ranger. So, do you lick the spoon? If my sweet hubby, Mr. Food Safety, reads this – I rarely NEVER eat raw cookie dough and I do NOT let his sweet, cherub children taste cake batter. Ghastly, nasty, dangerous food borne illness could be harbored in that sweet, succulent, delicious cake batter… Never the lips shall touch! You know what happens after a wonderful, busy, blissful vacation? Everyone else trots into work or school all happy-go-lucky. They are rested and ready to face whatever challenge awaits. You know what happens to Momma? She starts the endless piles of laundry, grocery shopping, going through the mail, cleaning out the car, catching up on committee work, searching through bags for her camera card, etc., etc., etc…. Ah, it’s so good to be home. I think.